43 years, 8 months, 29 days old age. Vijay Antony will turn 44 on 24 July, 2019. Only 3 months, 1 days, 10 hours, 29 minutes has left for his next birthday. Vijay Antony has celebrated the total number of 43 birthdays till date. See the analysis by days count and bar graph. 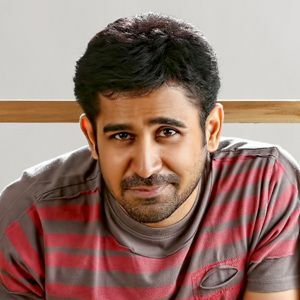 Vijay Antony was born on 24-07-1975 in Nagercoil in the state of Tamil Nadu, India. He is an Indian Composer, Playback Singer, Film Actor, Music Director, Singer, Film Producer & Lyricist who known for his work in Tamil, Telugu and Kannada films. Vijay Antony lost his father at an early age and his mother alone raised him and his sister. His childhood was spent in hardships. He obtained his graduate degree in Science from St Xavier's College, Trichy. He then enrolled for a visual communications course in the famous Loyola college of Chennai. While studying, he was also doing a part-time job in a studio. After obtaining his degree from the Loyola College, he set up his own studio called 'Audiophiles’. After doing sound engineering initially in his studio, he later composed jingles for documentaries and TV. He was then approached by Aascar Ravichandran to compose music for the Tamil film Dishyum. However, since the film released later, Sukran marked his debut as a Music Director.Meanwhile, he was approached by many other directors as well to compose music for their films. He became the most sought after composer in Tamil film industry after A.R. Rahman after giving mega musical hits like Ninaithale Inikkum and Vettaikaaran among others. He created history by winning the Cannes Golden Lion under the category of Best Music award for his advertising film NakkaMukka in 2009. After becoming an established composer in the industry, he tried his hands at acting. Though he already played a cameo role in films like Kizhakku Kadalkarai Salai and TN 07 AL 4777, he made his full-fledged acting debut with the thriller film Naan in 2012. After which, he appeared in few more films like India Pakistan, Yaman, and Salim among others. Vijay is married to Fatima since 2006 and has two daughters with her.